Composition:Extract of Radix Tripterygii Wilfordii,it is new formula. Action and Use:It is used for anti-inflammation, immunosuppression. It is applicable to rheumatoid arthritis. Dosage and Administration:taken orally, 1-2 tablets each time, 2-3 times per day for adult. 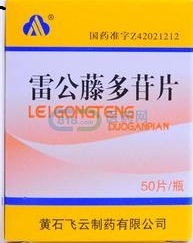 Caution:To be taken under the guidance of the doctor.It is not used for the patient with abnormal heart, liver, kidneys, arrhythmia, active ulceration of duodenal, pregnant women and the women nursing a children. Carefully used for allergic patient and old, valetudinarianism, and children. Image for the illustrative purpose.